Customers can easily avail from us these Middle School Summer Uniforms in bulk at the most comprehensive and whole sale prices. In order to keep the students comfortable in summers, we have designed this uniform from the use of high quality light and breathable fabric. The fabric is cool and soothing which helps absorb sweat as well. It is easy to wash and can be availed from us in standard fits and sizes. 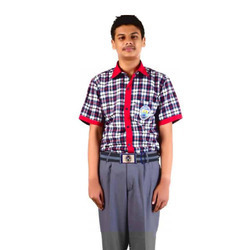 We are extensively engaged in the fabrication of this range of Junior Boys Summer Uniforms. The offered range has been offered to the customers at the best and most legit prices. We undertake stitching of these uniforms in bulk. Our designing team makes use of high quality fabrics only in the making of this uniform. We have complete knowledge of the sizes and the perfect stitch methods for complete comfort of the kids. We have emerged as one of the widely appreciated fabricators of this range of Junior Girls Summer Uniforms. 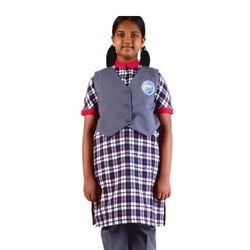 The offered uniform can be availed from us at wholesale prices. We undertake the stitching of these uniforms as per the predefined customer specifications. Our designers make use of only high quality raw material such as polyester and cotton fabric in the making of this range. Looking for Summer Uniforms ?